Yesterday, a group of kids (my nephew’s classmates) came to my house. My nephew is four-and-a-half years old and is studying in LKG. He calls me ‘aachachen‘. When he was young, everybody made him call me Alex Achachen. Since it was way beyond the capabilities of a one-year old child, he shortened it to ‘aachachen.’ I never bothered to change it. After all, what is in a name? I am the resident storyteller at our home. I am a good narrator and use all sorts of special effects, sounds, background music, etc., while telling the story. Also I make it a point to tell a story with subtle variations, each time it is repeated. So, if I am telling the story of the “Sleeping Beauty”, each time I will add new elements, new characters, new subplots and so on. My nephew likes it the most, when I make him a character in the story. The only downside of this mode of storytelling is that, I always have to tell the same story over and over again. I must have told the stories like ‘Beauty and the Beat’, ‘Cinderella’, ‘Snow White and the seven Dwarfs’, ‘Magic Porridge Pot’, ‘Wizard of Oz’ and so on more than 40 -50 times each. My nephew likes to hear the stories being narrated to him. So, even though, he knows the story, he will make me repeat it again and again. He will then narrate the stories to his sister who is in play school. He got the first prize for storytelling at his school, for telling a modern version of the ‘Sleeping Beauty’ where the prince comes on a Kawasaki bike (instead of a horse) and uses a lightsaber (yes the one from Star Wars, instead of the good old sword). My policy with kids is that whenever they ask me why I am not walking, why I am sitting on the vehicle (wheelchair), what are the switches on the wheelchair for, etc., I usually try to explain to them what is spinal cord injury, how I ended on the wheelchair, how to operate the switches, and so on. Kids ask these questions to satisfy their curiosity and shooing them away, will quell their zeal for learning and I don’t want to be the one committing that crime. So depending on the age of the kids, I have many different explanations on what is spinal cord injury, road traffic accident, wheelchair and its uses. I even allow the kids to perform some of the functions just to keep them happy. I use a Levo standup wheelchair. The Levo logo looks very similar to that of Lego. I bought it a few years back, for standing up, but now am not using the standup functionality due to severe spasms. But the wheelchair has an array of switches and a battery pack. So from a kid’s perspective, I have all the components of a high-tech gizmo. There are four wheels, there is an array of switches, there is a battery pack, and the action figure sitting on that vehicle speaks, moves around—just like the toys the kids see everyday. Now coming back to yesterday’s incident, my nephew and his friends came to my room. He told his friends that I am his ‘aachachen.’ I didn’t know what the kids made out that. Anyway, he then asked me to tell a story. I asked him which story he wanted. Princess and the Frog, he replied. I started narrating the story with all the usual special effects and background sounds. Then it was ‘Thumbelina’ followed by ‘Cinderella’ followed by ‘The Gingerbread Man’ followed by ‘Jack and the Beanstalk’ and so on. I must have told the kids at least 6 – 8 stories. When I looked at the clock, I realized that I had spent more than two hours with the kids. During those two hours, except for some clarification and requests for encore, none of them moved from their seats. I think I must have made a pretty good impression on them. Only then I realized the kids thought that ‘aachachen’ was the name of the high-tech toy, they were playing with till then. I couldn’t stop laughing for almost ten minutes. Children never stop to amaze me. Certainly, you might have told those stories with your own magic touch, I can imagine it..! BTW, you look like a film star in that photograph, Alexis…! Now that is the greatest compliment I have ever heard! Really heartwarming post on a avery cute but highly volatile and intelligent subject-kids!!! Jo: Telling story to kids is something that I always loved. Talking about ‘Balarama’ brought back old memories. When I was a kid, I used to read “Balarama” and “Poompatta” regularly. Anup: You are absolutely right. Answering the questions asked by kids is more difficult as they don’t have any inhibitions and would continue asking until they are completely satisfied. One cannot escape after giving an ambiguous answer. James Bright: Thanks James. Your son is right. The image is created from the poster of the movie “i,ROBOT” starring Will Smith, based on the book by the same name by Issac Asimov in which he sets out the principles of robot behavior—The three laws of Robotics. My photo was placed in the poster after replacing Will Smith’s photo. 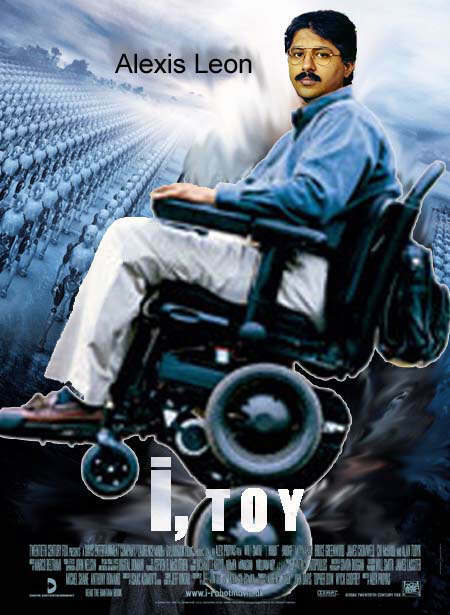 The wheelchair shown in the figure is called ‘iBOT’ and has the capability to standup, climb stairs, jump obstacles, etc., but costs a fortune and is only available in the US. My wheelchair is something less spectacular. The image was created by my brother Mathews, using Adobe Photoshop. silverine: Yes I liked it too. I look forward to reading your baby sitting experiences. “The wolf ate ammachi” comment by your little cousin is really hilarious. Yes, she got the essence of the story right. im sure the kids were very impressed..
From reading this narrative, I can certainly understand how you got the title of ‘resident storyteller.’ Your written narration is very good as well! Shall return to hear more stories from you:-). In the meanwhile, shall check out some of your previous posts as well.